Protesters outside the meeting chanted in English, Spanish and Cantonese. 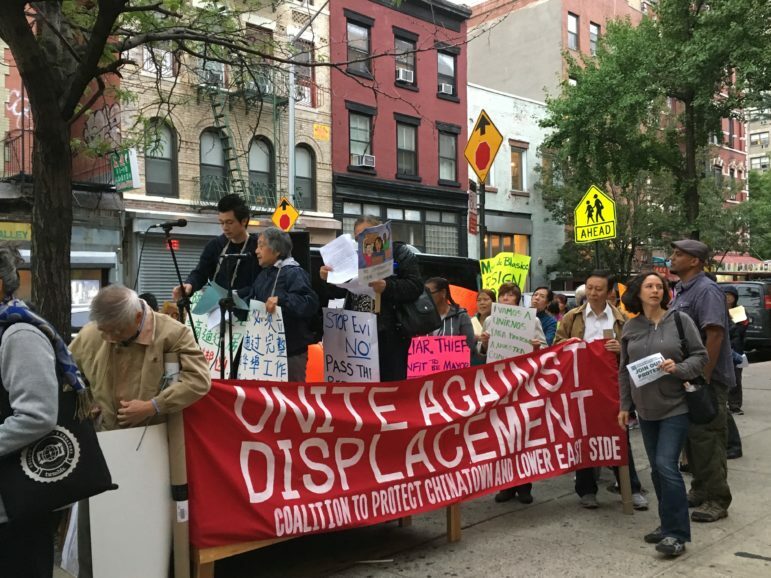 At a Community Board 3 Land Use Committee meeting Thursday night to discuss plans to rezone Chinatown, neighborhood residents expressed confusion and frustration over the city’s treatment of their community-drafted rezoning proposal. A collaborative effort launched in 2008 by the Chinatown Working Group (CWG), an organization formed to help preserve the affordability of the neighborhood, this proposal aimed to create a “Special District” spanning Chinatown and the Lower East Side and put in place zoning protections that would benefit immigrant, working class and public housing residents over a sizable portion of Lower Manhattan. The Department of City Planning (DCP), which rejected the full CWG proposal in February 2015, said the plan is too expansive, and called for the creation of a narrower proposal focused more specifically on Chinatown—but community advocates have not backed down, arguing that the affordability crisis in the area requires prompt, widespread action. Thursday’s meeting included a presentation by representatives from DCP on what the path towards a Chinatown neighborhood rezoning plan might look like, emphasizing the many opportunities for community engagement that will be a part of the process. But many community residents in the audience weren’t convinced. James Rodriguez, of the neighborhood housing and preservation organization “Good Old Lower East Side” (GOLES), said the meeting felt disingenuous. Several attendees raised questions about DCP’s criteria for deciding the original CWG proposal was not feasible. Joel Kolkmann of the department’s Manhattan office said the geographic scope of the plan was simply too large to implement, and proposals need to be targeted on a neighborhood basis. Edith Hsu-Chen, director of DCP’s Manhattan office, emphasized that focusing on Chinatown specifically now doesn’t mean issues in other neighborhoods won’t be addressed in the future, but simply that it’s best for neighborhoods to be addressed individually. But for some, a plan that leaves out the Lower East Side and other areas included in CWG’s proposal is difficult to accept. City Limits’ reporting on housing and development is supported by the Charles H. Revson Foundation and the New York Community Trust. The de Blasio administration is moving to develop vacant spaces in the Brooklyn neighborhood for a mix of affordable housing and other services—building on earlier plans, engaging the community and encountering a mix of reactions. It’s unclear how closely the city’s rezoning proposal will follow the most detailed community-based plan to emerge during the two-plus years of the de Blasio administration’s housing push.